I recently had an interview with one of the world's biggest employers. It was my first ever interview experience (excluding the BBC) with the public sector. Before I entered the reception area of the offices situated on the outskirts of town, I was optimistic, even excited, about the possibilities that working for this giant might bring. And so in front of an audience of four immaculate but glum-looking ladies all sitting there in their black suits and manicured nails, I dialled through to the department who were interviewing me and told them that I had arrived. I was informed that they were running very late and to take a seat. I turned to look at the four expressionless ladies and the penny dropped - they were all waiting for the same interview. I wondered whether it was appropriate to talk to the enemies, but in the end we all sat in silence, listening to the ticking of the clock from 1987 that hung from a nail nearby. Having spent the last eight years bringing up my children and working as a freelance writer, this was my first formal interview for a very long time. So it was a massive deal for me to be here, I was very nervous, and I prayed that the interviewers would be nice personable people. I envisaged chatting merrily about what I had been doing in the last eight years, and about my varied work before having children, and sharing my enthusiasm and excitement about the prospect of working in an office again. After an hour of sitting in the dreary unheated reception area, watching more and more ladies arrive for the same interview, my enthusiasm began to wane. After an hour and forty-five minutes, which is when my name was finally called, it was all I could do not to run screaming from the building. Things only went downhill from there. I was ushered into a windowless box room where the manager, Glenda, and the lady currently doing the job that had been advertised, Susan, sat with their orange clipboards. Pretty soon, I couldn't summon up enough mental energy to respond with more than a 'yes' or 'no' answer. 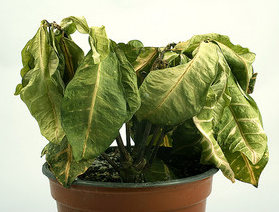 Unbelievably, there was a wilted pot plant on the desk between us, a clumsy metaphor for the situation, which I really wanted to point out to them. 'Why do you want to work for this organisation'? asked Susan. I told them how wonderful I thought this institution was and how it offers a fantastic public service, and how great it would be to be part of such an important service. To which Susan replied (in a very similar robotic nasally voice to Glenda) 'Yes well you wouldn't think that after working here for thirty years like we have.' This was the first time either of them had actually said anything in response to any of my answers. At one point I tried to engage them in an actual conversation about my work at the BBC, and LearnDirect, and my writing, and my award-winning blog, but evidently they didn't want a conversation, or to find out anything about me, or to employ anyone with a heartbeat, so I dragged my attention back to the questions on their clipboards. 'Imagine you had this job and a parent at your child's school approached you in the playground and asked you for confidential information about another child. How would you respond?' I could tell that Susan was really proud of herself for coming up with this question. 'I would tell the parent that if they slipped me a tenner I would tell them whatever they wanted to know,' I replied. Even this didn't induce any kind of response, apart from a robotically raised eyebrow or two. We reached the last question, which Glenda dramatically informed me was a question from the organisation itself. Drum roll. Finally something interesting I thought. 'Do you have anything to declare? Any conflicts of interest, such as convictions or bankruptcy'? I laughed out loud, and told them that I thought it was going to be something a bit more exciting, perhaps about privatisation of the organisation, or my views of its constant presence in the news, and the political war surrounding it. Glenda and Susan just stared at me and waited for my answer. What remained of my will to live stirred up inside me once more, and I considered telling them that I was actually on the run from the cops, having just robbed a bank, and could they keep it schtum, but instead I just shook my head with a sigh. After the interview finished I went to Tesco and then sat in the car park and ate a cheese sandwich. Oh dear. I can only assume that we're talking about the NHS here. Here's hoping that you didn't get the job, it sounds dire! Long live freelancing.